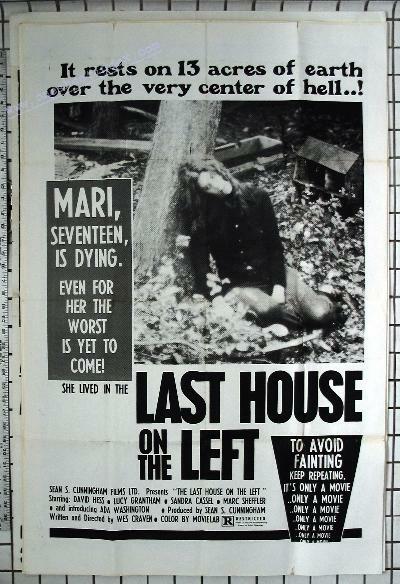 Last House on the Left is one of the few motion pictures ever to stimulate so much public opinion People either leave it or despise it Few have no opinion In this film, unlike ac many recent, successful motion pictures violence is not glorified, nor the violators romanticized AU is shown as ugly as it is in real life For example, in many recent films people are killed in typical "Hollywood" fashion They do not bleed They do not suffer In Last House on the Left homicide is portrayed in its true nature, real people dying tragically. In past films criminals have been shown as glamorous and heroic so that the audience may identify with them in a happy and pleasant manner. In Last House on the Left the criminals are shown in true perspective as sick and degenerate people. Nor does the film make any attempt to glorify or minimize the risks in experimenting with drugs The portrayed consequences are not only probable but fittingly horrifying. The purpose of Last House on the Left is to bring a true measure of real violence to its viewers Shock, horror and total outrage are expected Our question Should the outrage be directed at the portrayal on the screen or the conditions that allow such events to occur. Last House on the Left is rated R in the best sense of that rating.